« Hi, I’m in China. Well, it took me longer to get off the ground than I said it would (typical), but I’m super stoked to have finally finalized the details for my $10k 1st Year Pro Scholarship I announced last year in conjunction with my ROKA Performance Aviator Launch. Massive thanks to USA Triathlon Foundation for partnering with me on this initiative. See below for all the info, and please share with anyone you think would be interested! Also note that applications are due in a week, so get on it! Comment below, or email me – jesse@leapdaysports.com – if you have any questions. Thanks as always and good luck! Details and application on this website! Right here! Where you’re looking! As a kid who grew up dreaming of being a professional athlete, the last seven years have literally been a dream come true. During my time as a professional triathlete, I’ve pushed my physical and mental limits further than I ever imagined, accomplished some of my biggest goals, become part of an incredible community, and supported my family – all while doing something I love. When I started professional triathlon, I was a late 29 year old engineer/MBA ex-runner who hadn’t competed in years. The sport was expensive, paid very little, and I knew almost nothing about it athletically and professionally. Without the remarkable support of family, friends, coaches, and mentors, particularly in that first year, there is no way I would have made it, much less accomplished what I have today. 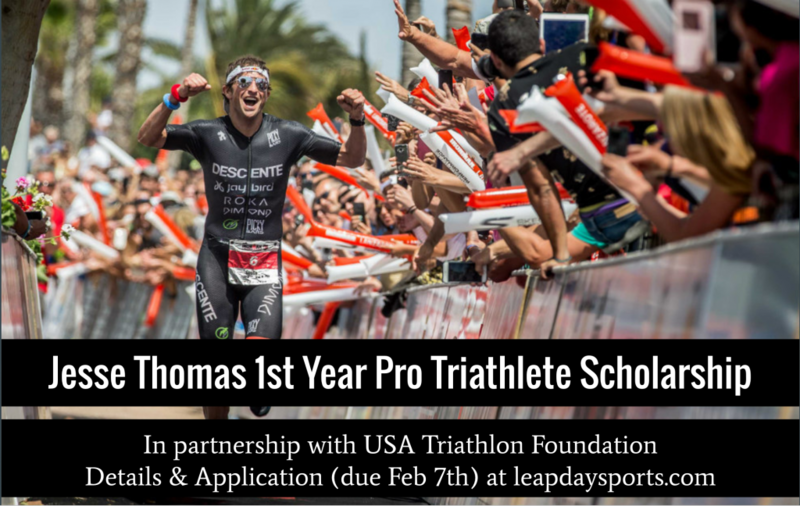 As a thank you to those who helped me, and with the hope of helping others realize their dreams, Lauren and I are offering a $10,000 scholarship fund to be divided among two to four 1st year pro triathletes in 2017. I will also provide professional development advice to those selected candidates. Some of my partners, currently including ROKA, Descente and Picky Bars, will provide product support where appropriate and non-conflicting with recipients current sponsors. Their short term and long term goals both inside and outside of the sport. Their past, current and planned contributions to the sport and the communities they interact with through triathlon. The potential for success and positive impact on the sport and it’s communities. I feel incredibly grateful and honored by the support I’ve received during my career. I couldn’t have imagined it would lead to the opportunities I’ve had. Thank you all so much, and I hope that this program helps create an opportunity for other athletes to also realize thier dreams. Application Due Feb 7th 11:59pm PST – fill out below, or use this link to open a new window. I think this is a great thing your doing. Well done sir! Great way to give back to the sport and help the next generation! Still working on it, but yes. Will be announced soon.